Bayonne, NJ Austin Wright’s Karate Dojos Have Been Recognized for Excellence and Proven World Champions (3) Generations Strong! 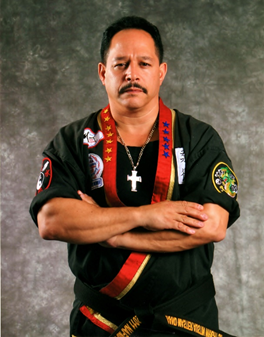 Recently, (7) Unique World Hall of Fames, Organization and The “Alliance” under Grand Master Dr. Jim Thomas President recognized Austin Wright’s Dojos as the Multi-Discipline International World Championships Academies because of their Proven Seminars and Competition results. It started with their Sensei and Father Hanshi Grand Master Dennis Austin Wright in the Mid 1950’s at the Bayonne M.O.T.B.Y. Base Learning Jujitsu, in the 60’s with Isshin-Ryu Karate and a Kick-Boxing in the 70’s A Combined Martial Arts theory that has been proven now for (3) Generations. At Hanshi (Grand Master ) Austin Wright’s Karate Dojos of Combined Martial Arts MMA and Self-Defense students learn Traditional Martial Arts of Okinawan Isshin-Ryu Karate (8th Dan), Tactical Japanese Judo Jujitsu Combative Arts (9th Dan), American Kick-Boxing (PKF) and MMA Fitness for the Entire Family Ages 3 to Adult. We offer Senior Citizen Programs, Special Needs and Women’s Programs at 250 Broadway, corner of 10th Street, Bayonne, NJ and 1683 Kennedy Blvd., Jersey City, NJ. All Programs have been Proven in the International World Martial Arts Arena in Self-Defense, Team Competition and Fitness Weight Loss Program! Wright’s Philosophy has been about CHI (Character Humility Integrity) “If you change your Character you Change your Life”. We are offering Beginners Classes Now call 201-437-1820. 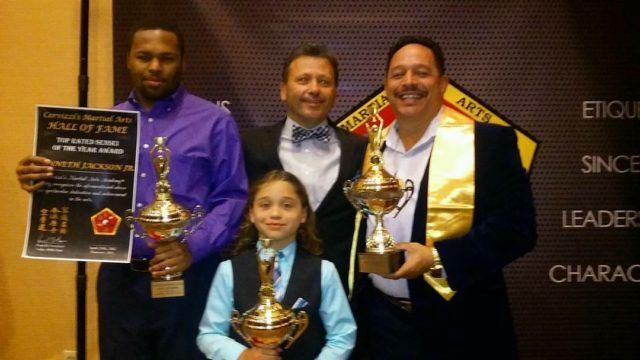 Picture: Left to Right (Back) Kenneth C. Jackson, World Champion, Soke Paul Cervizzi, Tournament and Hall of Fame Director, Hanshi Grand Master Austin Wright Sr., (Front) Chance Fisher, National Champion.